You wake up in the morning, get cleaned up, dressed, and eat breakfast (at least drink coffee) and then you look for your cel phone, laptop, or mp3 player before you head out the door. You check the usual places and find what you need, only to discover that the power is low! Now what? 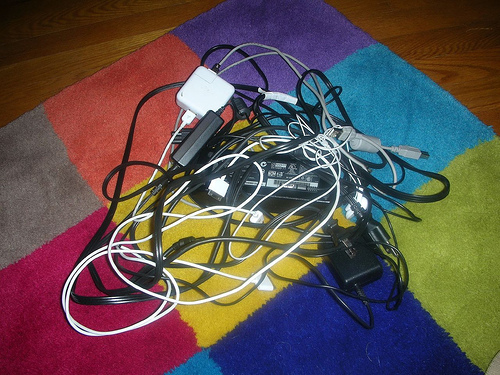 Now you start that far more taxing task of trying to find the charger cord for the device. The advent of the rechargeable batteries to operate these devices was great, but brought along with it a myriad of cables, cords, and adapters. There are very few of these that work with more than one of our devices. Apple things have a totally different interface than do Black Berries, and different again from e-readers. Even within one range of device, the Nintendo DS series, the adapters are different depending upon which version of the hand-held game device you happen to have. So you need the cord with which your Black Berry can charge in the car. Well, obviously it must be in the car right? Not necessarily. You may not have used it there yet, or perhaps you were travelling with a friend and stuck it in a purse or piece of luggage incase you needed it. Your kids may have borrowed it, or it may be in your spouse’s car. How about the USB cord for your I-Pod? I’m sure you put it someplace safe, but where. It is truly amazing how these little bits of electronic accessories can hide between couch cushions , between bills in the stack, in pockets etc. They usually turn up shortly after you have given up and paid a princely sum to get new ones. Just as the improvements of computers did not make our homes and workplaces paperless, our wireless devices do not actually leave us unplugged. At some point, without the cords, cables, and adapters our devices just become cute paperweights. We have become even more dependant on electricity than we were fifty years ago. So, for folks in my area, as you prepare for the oncoming hurricane Irene, don’t forget to get a full charge on all your “wireless” devices. I don’t know if I have mentioned my Kobo e-reader in any other posts or not, but it came up today as a topic and, as I’m not swamped with good ideas, I decided to go with it. 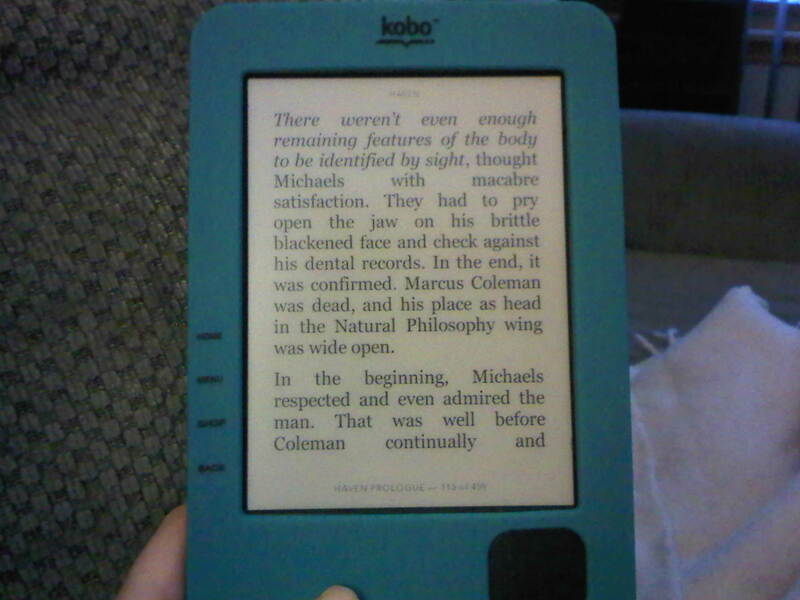 I love my Kobo! When I went away on vacation I had around 130 books with me in my purse, from which to choose reading material for when I was on the plane, in the airport, laying out on a chair on the beach, or getting ready for bed at night. The last time I took the same trip I just squeaked within the weight limit for checked baggage and most of the weight was from the books I had with me. This, along with the relatively low-cost of e-books, is the up-side to using an e-reader. The down side, at least for me, is that when I come across a really classic quote which may spark a blog post I don’t have a good way to mark it for later. I know that some of the e-readers do have the opportunity to put tabs on various pages, or to highlight important lines of text, but even then you just don’t have the same way of flipping quickly past the pages to find the good bits. I have on occasion written down the chapter and page number for the quote, but even that can be mucked up if I read it in one font and size and then go back to find it with the font changed. I’m going to stick with my Kobo despite this snag because it is so easy on my hands to hold it, and so convenient to carry it. I can also read in bed with my hands tucked under the sheets, only needing to shoot one out at the end of each page to push advance. 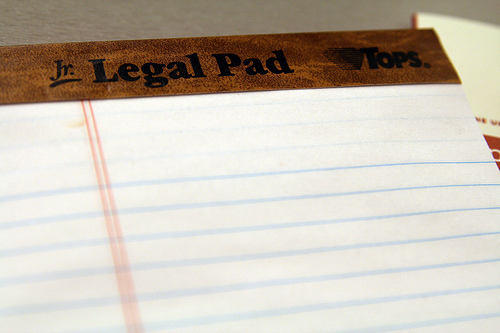 Maybe I’ll get a case for it that has a little notepad attached. Very old school meets new! When I was a kid/teenager, a rainy day in the summer meant a total overhaul of plans. As my normal form of transportation at the time was on foot or on my bike, both of my normal ways of getting together with friends were suddenly very unpleasant. Plans for the beach or the like were cancelled. I probably curled up with the telephone, to talk at length with my friends, and a good book. Today was a rainy summer Tuesday. My daughter got up had something to eat and tidied a bit while waiting for her friend to be dropped off by car. They then proceeded to watch tv and play video games the whole day. Basically, it was business as usual for her. I am sad to say that going outside and being active is not in the usual cards for my kids. They do it sometimes and enjoy it, but only rarely. For me, the rainy day involved getting wet going to and from the car when dropping off my other daughter at work, doing some housework, and curling up on the chouch with my kobo (the good book in the new century). For me the real change is the number of times I fell asleep on the couch while reading. A Different View Of Narative: Is This How God Sees History? I was listening to a radio talk show on CBC today, as I often do when I am in the car. The topic today was ‘the book’ and the place in our lives for books with paper, ink and bindings at a time when we can carry hundreds of books with us everywhere on Kobos, Kindles, IPads etc. They were talking about being able to be in on and or read a record of the social process that goes into writing a book as well as the social experience of reading and talking with others about the book. They mentioned the way in which writing changed as it became adapted to portrayal on movie, and later TV screens. The question was, would writing for e-books differ in any way from writing for printed and bound books? This got me thinking about the way text works on a computer, specifically text wrapping. When you write on a page of paper you literally move your hand and pen to a new location once you run out of space on one line. This is not really the case anymore for those of us who use the computer as our writing implement. If there were no limit to the screen size our sentences and paragraphs would just continue in one unending line, like a timeline. When we are talking about a narrative form of writing this actually makes a great deal of sense as it would literally represent the passage of time in the plot. Imagine with me…If there was some way for this format to actually exist the beginning of the story would be on the far left and the ending would be perhaps a great distance to its right on the same plane. If there were flashbacks they would have to actually precede the beginning but may appear on a second line of text with an indication perhaps a second chapter marking or something. Similarly if there were going to be another perspective introduced, say that of another character, which coincided in time with the main plot it would need to be in the correct space on the timeline but below the main plot line. I suppose in the interest of space one might allow for a new timeline for each section of the story otherwise our texts would take far more than the space the walls in one room could accommodate. For people who struggle with keeping track of the plot with twists and turns and reflections forward and backward, this format would provide a clear visual delineation while allowing you to see the whole thing there at once. This is not, obviously, something that will ever happen; although if there is an artist interested in the idea for an exhibition they are welcome to the idea. There are far more obstacles involved than would be worth it. He sort of sounds like the ultimate narrative author. But what of the idea of predestination? The idea that God already knows what will happen in all of our life, including all the choices we will ever make, even before we are born is often dismissed as totally ridiculous. People feel that there is no way to reconcile the idea that our actions are predestined with the notion of free will. This is where my narrative image above might help. I believe that God does not see the world and time in the same way as we do. I believe, in fact, that God sees literally everything that is happening, has happened and will happened all at the same time every moment. So, while I may have the free will to make big mistakes, God already knew I would make them and put in place choices for me to get back on track. We are only able to look back on what has happened this far in our lives and can now identify the turning points which were not apparent at the time. We can try to look forward to the future but not with any clarity. All we can see is this moment right here and now. Isn’t it at least a bit comforting to know that there is someone far greater than us, who already knows how the story turns out, who will, in our future, keep giving us the chance to redeem our mistakes?